One of the challenges I suspect we'll face this year is knowing which vagrant to twitch as and when they're reported. There's a temptation to chase vagrants with more compulsion than common-sense. Time will tell if our more sober attitude to the 800 Challenge, at least early on in the year, is the wrong approach. If anything though, neither of us are complacent, generally. 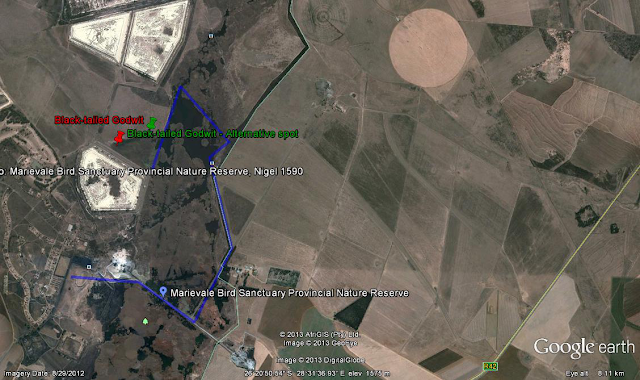 The recently reported Black-tailed Godwit (BTG) at Marievale Bird Sanctuary was our first successful twitch of the 800C. 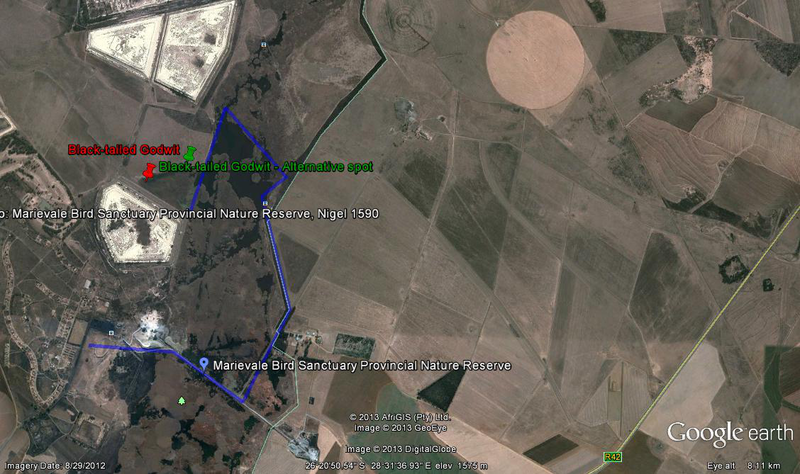 Fortunately the bird was reported relatively close to home-base which made it easier to find the few hours we needed to tick the bird. We'd seen BTG before in the sub-region but not near Johannesburg. This then a welcome addition to our Gauteng & Surrounds list (426). We'd agreed that both Alisha and I had to see the bird [at the same sighting] before it could be successfully added to our 800C list. That would mean finding a window where we both had time. That opportunity presented itself on Wednesday (16 Jan) afternoon at 4:30pm which is always an interesting time of day to get 'out' of Johannesburg. We had a vague idea where the bird had last been seen - '500m past the Shelduck Hide..' and having arrived at Marievale at 5:30pm approximately, time wasn't on our side. Getting to the Shelduck Hide was also an adventure in itself as we had, rather stupidly and in haste, taken Alisha's car rather than one of the SUVs. We popped into the Shelduck briefly for a quick squiz (look). Here we found Great Crested Grebe and one or two others we needed for the list. The BTG we found shortly thereafter further along the shore [heading 'west'] at the last bit of open water before the road swings away and back toward the large mine dump in the top left of the picture above. We'd left our long lenses at home, not anticipating much in the way of anything decent in fading light [irrational exuberance!] As it was the light was impractical but having watched the bird and its seemingly unusual tolerance for whooping twitchers on a quest, I would imagine that in better light and at a better time of day, good pictures are possible, if not probable. We were on the 'east' of the bird but we did, however, take a few record shots anyway. Trying to get on the western side of the bird proved impossible and the bird flew off to a spot I've marked in picture 2 below as a possible 'alternative spot'. 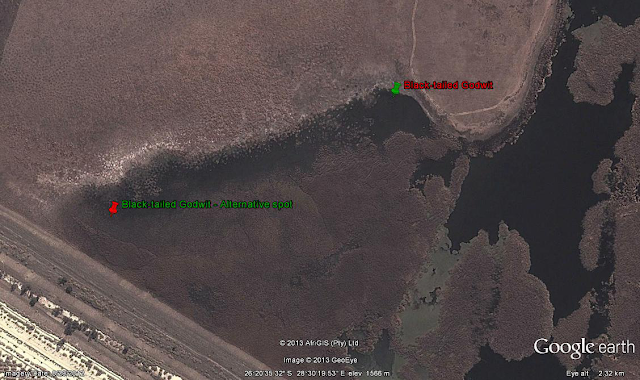 Birders who have missed the bird might want to check here if the bird is missed in the more regular spot, (green tag).